Project summary: major environmental hazards may lead to serious, chronic pathologies with large societal and economic costs, especially when exposed during critical developmental periods in pregnancy or early life. Special susceptibility during these times requires special protection through public health action and environmental legislation. Many associations between early-life exposures and health remain poorly characterised, giving rise to uncertain health risk and impact assessments due to lack of comprehensive data on exposure to multiple environmental hazards in early life, the large degree of exposure misclassification and uncertainties, and lack of integrated multiple environmental hazards and individual variability to estimate combined effects on health. Focus has almost uniquely been on single exposure-health effect relationships, lacking a global view of how various types of exposures co-exist and jointly impact on health during critical developmental periods. 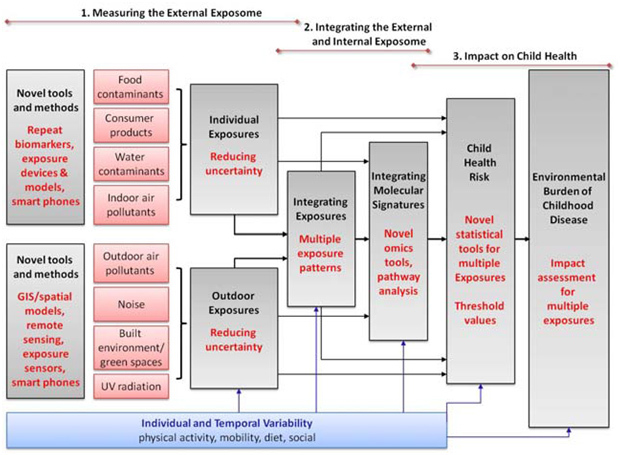 The “exposome” encompasses the totality of human environmental exposures from conception onwards; key focus is its epidemiological applications for prevention of human disease. The HELIX (Human Early-Life Exposome) concept is built around these needs in human population studies. Key Words: exposome concept, molecular exposure signature, environment, pollutants, predictors, genes, disease risks, health protection,epidemiological applications, –omics techniques, bioinformatic tools, database, early-exposome tool kit. 11 Sensing & Control Systems S.L. (ES) S&C Private/ Technology based co.
As presented previously, theexposome encompasses the totality of human environmental exposures from conception onwards; key focus is its epidemiological applications for prevention of human disease. The HELIX (Human Early-Life Exposome) concept is built around these needs in human population studies (Figure 1, p6). The “exposome concept” was first proposed by Wild (1) to encompass the totality of human environmental (i.e. non-genetic) exposures from conception onwards, complementing the genome; the key focus of the exposome is on its epidemiological applications for prevention of human disease (2). As such, the exposome is a useful framework for improvement and integration of currently scattered exposure data and moving towards a multiple exposure approach in human population studies. However, there are large challenges in developing this concept into a workable approach, mainly because of its multi-dimensional nature: a successful exposome would have to integrate many environmental exposures from different sources, multiple exposure time points, external and internalexposures, and individual behaviours and susceptibilities.At the same time, there is a strong consensus among environmental health risk assessment disciplines thatnew integrative tools, approaches and data for human exposure characterization are needed in order to significantlyadvance health risk and impact assessments and health protection (3, 4, 5). The exposome will play key role in this. – Identification of environmentally relevant mixtures: translation from experimental results to the real-worldrequires knowledge of how chemicals and physical factors (such as noise, factors in the built environment) coexistin the real world. This knowledge would lead to more focused mixture assessments in experimentalsetting (4) and more focused prevention strategies. – Robust human exposure data: chemical risk assessment often involves the translation from toxicityinformation to human health and this has many uncertainties (4). Measured human exposure data (frombiomonitoring or other methods) are often lacking or uncertain. Reduction in uncertainty requires feeding thetoxicological results with real world human exposures. In other areas, such as risk assessment of air pollutantsor noise, which are based mainly on epidemiological studies, there are large uncertainties in thecharacterization of personal exposure. Particularly we need to get closer to internal, biologically effective dose(6). In all areas, uncertainty in human exposure estimation needs to be characterized, quantified and reduced. – Information on variability and susceptibility in human populations: improved translation from experimentalevidence and improved dose-response characterization also require knowledge on how individual behaviours,physical environments and genes (although not the focus of the current project), interact with environmentalexposures to impact on health, and on how vulnerable populations can be protected (4, 6, 7, 8); Which“cocktails” of exposures and behaviours are associated with health? Can we identify vulnerable populations? Can we identify critical time periods for prevention? – Integration of new molecular techniques: high-throughput molecular biology techniques have opened the doorfor more global (rather than single-chemical) exposure characterization through characterization of molecularexposure profiles (1, 9, 10), but such methods have been little tested in human studies and their application isuncertain (11). The use of key biomarkers as indicators for biological pathways will further support theplausibility of associations between exposure and health outcomes. 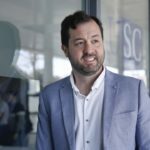 – Novel tools to analyse health risk and impact related to complex multiple exposures: Collection of data on many chemical and physical exposures and on molecular exposure profiles, generates huge amounts of data: conventional statistical techniques have reached their limits here. New analysis tools are needed to estimate health risk and health impact whilst taking account of the complexities of exposome data. The uniqueness of the HELIX concept lies in its development of a comprehensive set of tools, methods and prospective data for integrating the chemical, physical and molecular/biological environment and linking this to human health during the most critical periods of disease development. This has not been achieved before and is ambitious; most previous EU projects focus on specific families of exposures. The exposome challenge, however, is to aim for more holistic data and integrative methods. The strong focus of HELIX on pregnancy and early life, and its use of a large body of existing data and expertise, ensures that the project is both feasible and realistic. HELIX relies on six longitudinal cohorts for collection of individual information on exposures, behaviours and health. Repeated cross-sectional studies or ecological approaches are much more limited here. The project/ consortium will develop the early-life exposome toolkit and database in three overlapping steps, each focusing on the development of specific tools and methods to obtain and analyseexposome data. Develop and apply tools and methods to obtain robust estimates of exposures to persistent and non-persistent pollutants in food, consumer products, water and indoor air, in pregnancy and early childhood. Develop and apply tools and methods to obtain robust estimates of chemical and physical exposures in the outdoor environment during pregnancy and early childhood: ambient air pollution, ambient noise, green space/built environment, ultra-violet radiation. Develop tools to integrate data on multiple exposures, exposure predictors, and individual exposure variability (temporal, behavioural, toxicokinetic), in order to define multiple exposure patterns and describe exposure uncertainties. Measure molecular signatures associated with environmental exposures through analysis of profiles of metabolites, proteins, RNA transcripts, and DNA methylation. The -omics data generation will be completed in June 2016, with the data warehouse to be presented in December 2016. Develop novel statistical approaches for the analysis of the association of patterns of multiple and combined exposures and child health outcomes. Provide exposure-response estimates for the association between multiple and combined exposures, and child health. Focussing on foetal and childhood growth and obesity, neurodevelopment, and immune system-mediated outcomes. Estimate the burden of common childhood diseases that may be attributed to multiple environmental exposures in Europe. 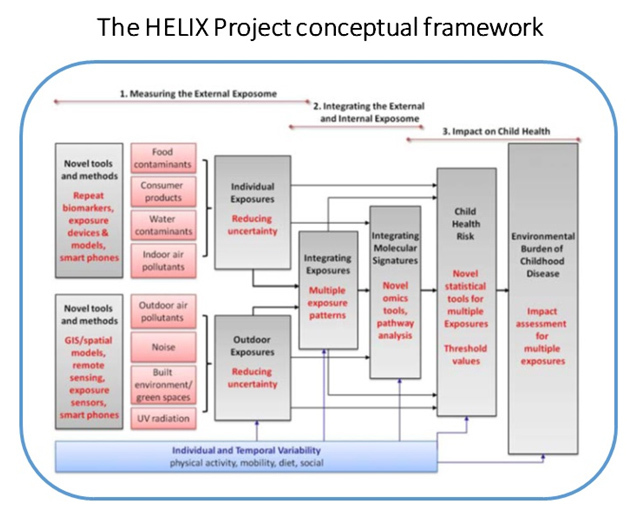 Using integrated health impact assessment tools, prevalence data from over 35 European birth cohorts (>300,000 subjects) and surveys, and exposure-response results from HELIX. Strengthen the knowledge base for European policy in the area of child and environmental health. Through engaging with, and effectively disseminating HELIX knowledge to, stakeholders including those responsible for risk management and mitigation and prevention strategies. This will provide guidance on priority areas for action with respect to monitoring and limiting pregnancy and childhood exposures. 1 Measuring the external exposome Development and application of tools and methods to obtain robust estimates of exposures to pollutants (persistent and nonpersistent) in food, consumer products, water, indoor air and outdoor environment during pregnancy and early childhood – Measurement of traditional biomarkers at repeated time points, to develope and validatepredictive exposure models. 2 Integrating the external and internal exposome Development of tools to integrate data on multiple exposures, exposure predictors, and individual exposure variability (temporal, behavioural, toxicokinetic), in order to define multiple exposure patterns and describe exposure uncertainties – Daily repeat of biomarker measurements, personal exposure assessments, dose estimates, and data on individual behaviours. 3.2- To provide exposure-response estimates for the association between multiple and combined exposures andchild health. 3.3- Estimation of common childhood diseases’ burden in Europe that may be attributed to multiple environmental exposures. 3.4- Strengthen the knowledge base for European policy in the area of child and environmental health (3.1) Development of a multi-step statistical approachusing novelstatistical techniques. (3.2) To focus on foetal and childhood growth and obesity, neurodevelopment, and immune systemmediated outcomes (asthma/respiratory health/infections), includingexamination of dose-response relationships and possible thresholds. (3.3) By using integrated health impact assessment tools, prevalence data from over 35 Europeanbirth cohorts (>300,000 subjects) and surveys, and exposure-response results from HELIX. By focusing on pregnancy and early childhood, and on complex scenarios of multipleexposures. Moreover we wanted to stress further the important role of the two SMEs inthe HELIX project, HYLO and S&C, providing us with the means and guidance/ leadership to overcome the gap between Research and Industry, through their links with the different parts of the commercial sector. The SMEs will work closely with other partners to develop models and methods.The relevance of such methods and results, on the other hand, willbe presented at project meetings to ensure that the output of SME work meets the expectations of the scientificcommunity. Overview of the HELIX partners. biomarkers/human biomonitoring, molecular epidemiology, metabolomics, proteomics, epigenomics, transcriptomics, toxicokinetic modelling, quantitative risk assessment, statistics, environmental medicine, software development, and public health policy in areas of environmental pollution and child health. WP 1is responsible for the development and application of novel tools and methods to obtain robust exposure estimates for individually assessed pollutants in food, consumer products, water, and indoor air. It will collect biological samples and questionnaires in the HELIX subcohort. It will carry out the panel studies in children and pregnant women to collect in-depth data on behaviours and repeat biological samples. It will then measure exposure biomarkers, develop exposure prediction models, and assign exposure estimates to the mother-child pairs. WP1 will provide biomarkers and exposure estimates, biological samples, and data on temporal variability and individual behaviour to WP3, WP4, WP5, WP6. WP 2will develop and apply novel tools and methods to obtain robust estimates of chemical and physical exposuresin the outdoor environment, focusing on outdoor air pollutants, noise, green space, and UV radiation. It will builda GIS environment, obtain modelled ambient GIS-based data from remote sensing and maps in the 6 study areas. Itwill develop a personal assessment kit of smart phones and sensors for air pollutants, UV, mobility, and physicalactivity, as part of the panel studies. It will then integrate these data to estimate inhaled dose (for air pollutants), tovalidate models, to estimate uncertainties, and to assign exposure estimates to the subjects in the study. WP2 willprovide exposure and dose estimates, physical activity and mobility data, to WP3, WP4, WP5, and WP6. WP 3will integrate data on multiple exposures, exposure predictors, and exposure variability (temporal, individual, toxicokinetic), in order to define multiple exposure patterns and describe exposure uncertainties. PBPK models will integrate biomarker measurements with toxicokinetic knowledge to predict internal dose. Data on temporal and individual variability (from WP1 and WP2), and on dose (from WP2 and the PBPK model), will be used to describe the main variance components and uncertainties in exposure estimates. WP3 will then use factor analysis and latent class analysis to uncover the nature of the underlying dependencies between exposures and to define exposure and biomarker patterns/clusters and describe their determinants. Results from WP3 (uncertainties, predictors, exposure patterns) will be used in WP4, WP5 and WP6. In WP 4will determine molecular signatures associated with environmental exposures through analysis of profiles of metabolites, proteins and gene expression. It will generate molecular profiles in biological samples from the cohort studies, correlate specific exposures (from WP1 and WP2) and exposure clusters (from WP3) to molecular profile data, and integrate information from molecular profiles using pathway analysis approaches to define biological pathways associated with exposure. WP4 will inform analyses of multiple exposures and child health in WP5. thesocietal dimensions of security, as well as the ethical and legal aspects, will be investigated systematically. An interdisciplinary approach. WP 5will characterize the effect of the exposome on specific highly prevalent child health outcomes. It will collect new harmonised outcome data in the cohorts, develop the data warehouse, develop the statistical analysisapproach using novel techniques for multiple exposures, and provide exposure-response estimates for theassociation between the exposome and child health, taking account of sources of measurement error and thresholds.WP5 will use exposure estimates from WP1 and WP2, exposure patterns, predictors, confounders, and uncertaintiesfrom WP3, and information on biological pathways from WP4. Results from WP5 will in particular be used byWP6 to translate dose-response relations into burden of disease estimates and individual risk predictions. WP6will estimate the burden of adverse child health outcomes that may be attributed to multiple environmental exposures in Europe. It will construct scenarios for the health impact assessment, working from straightforwardone exposure, one health outcome assessments to more complex benefit-harm scenarios. It will use exposureestimates from WP1 and WP2 and exposure-response data from WP5, combined with data from European birthcohorts and surveys, and from the literature. Expert workshops will be organised to obtain information. WP6 willalso combine risk factor information collected by the project to develop an EXPOSOME mobile phone app toallow members of the public to assess their risk of adverse child health outcomes. 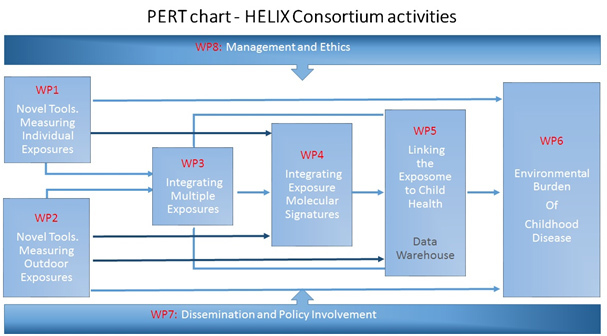 WP7will establish and maintain a framework of communication, dissemination and engagement with HELIX stakeholders, including scientists, policy developers, regulators, SMEs, to exploit outcomes of the project mostefficiently. It will also promote training and exchanges within and outside the Consortium. WP8will provide overall management of the project and will monitor ethics issues arising in the project. The interdependencies between the different WPs are shown in the PERT diagram (see next page,figure 2). Besides the presented WPs, the assessment of risk is an important issue in a scientific project, which always presents some uncertainty on theability to reach ambitious objectives. The HELIX project has drawn the corresponding Risk Plan, taking into account the risks believed to be more significant, and proposed contingency plans accordingly. The project coordinator and manager are responsible for the analysis and monitoring of risks, which will bediscussed with the Project Executive Committee (PEC; see TEAM’s table in p3), leaders of the WPs, and the Scientific Advisory Board (SAB) in order to ensure adequate monitoring. HELIX will make a contribution to the definition of an integrated exposure concept and prediction of individual disease risks related to environment, reduce the uncertainty in risk assessments of chemicals, lead to a better understanding of the effect of multiple exposures, such as to mixtures of chemicals, behaviour, and the physical environment, and improve preventive strategies to lower health costs. HELIX will contribute to increased EU competitiveness, especially that of SMEs that may find new business sectors in exposure characterisation and modelling. It will address three out of four of the priority goals of the Parma Declaration on Environment and Health (2010) and will contribute to a large range of specific EC policies on Environment and Health. Wild CP. Complementing the genome with an «exposome»: the outstanding challenge of environmental exposure measurement in molecular epidemiology. Cancer Epidemiol Biomarkers Prev. 2005 Aug;14(8):1847- 50. Wild CP. The exposome: from concept to utility. Int J Epidemiol. 2012 Jan 31. [Epub ahead of print]. No abstractavailable. NRC (National Research Council). 2007. Toxicity testing in the 21st Centrury: A vision and a strategy.Washington DC: National Academy Press. Cohen Hubal EA, Richard A, Aylward L, Edwards S, Gallagher J, Goldsmith MR, Isukapalli S, Tornero-VelezR, Weber E, Kavlock R. Advancing exposure characterization for chemical evaluation and risk assessment. J. Toxicol Environ Health B Crit Rev. 2010 Feb;13(2-4):299-313. Lioy PJ and Rappaport SM. Exposure science and the exposome: An opportunity for coherence in theenvironmental health sciences. Env Health Perspect 2011 119: 466-467. Sobus JR, Tan YM, Pleil JD, Sheldon LS. A biomonitoring framework to support exposure and riskassessments. Sci Total Environ. 2011 Oct 15;409(22):4875-84. Epub 2011 Sep 8. Pleil JD, Sheldon LS. Adapting concepts from systems biology to develop systems exposure event networks forexposure science research. Biomarkers. 2011 Mar;16(2):99-105. Epub 2010 Dec 8. Hines RN, Sargent D, Autrup H, Birnbaum LS, Brent RL, Doerrer NG, Cohen Hubal EA, Juberg DR, LaurentC, Luebke R, Olejniczak K, Portier CJ, Slikker W. Approaches for assessing risks to sensitive populations:lessons learned from evaluating risks in the pediatric population. Toxicol Sci. 2010 Jan;113(1):4-26. Epub 2009Sep 21. Rappaport SM, Smith MT. Epidemiology. Environment and disease risks. Science. 2010 Oct22;330(6003):460-1. Peters A, Hoek G, Katsouyanni K. Understanding the link between environmental exposures and health: doesthe exposome promise too much? J Epidemiol Community Health. 2012 Feb;66(2):103-5. Epub 2011 Nov 11. Gluckman PD, Hanson MA. Living with the past: evolution, development, and patterns of disease. Science.2004 Sep 17;305(5691):1733-6. Van Den Bergh BRH. Developmental programming of early brain and behaviour development and mentalhealth: a conceptual framework. Dev Med Child Neurol 2011, 53 (s4): 19-23. Landrigan PJ, Sonawane B, Butler L, Trasande L, Callan R, and Droller D. Early environmental origins ofneurodegenerative disease in later life. Environ.HealthPerspect. 2005 113 (9):1230-1233, 2005. Godfrey EB, Yoshikawa H. Caseworker-recipient interaction: welfare office differences, economic trajectories,and child outcomes. Child Dev. 2012 Jan;83(1):382-98. doi: 10.1111/j.1467-8624.2011.01697.x. Epub 2011Dec 19. Wang, Y. &Lobstein, T. Worldwide trends in childhood overweight and obesity. Int J PediatrObes 1, 11-25(2006). Bousquet J, Anto J, Auffray C, Akdis M, Cambon-Thomsen A, Keil T, Haahtela T, Lambrecht BN, PostmaDS, Sunyer J, et al. MeDALL (Mechanisms of the Development of ALLergy): an integrated approach fromphenotypes to systems medicine. Allergy. 2011 May;66(5):596-604. doi: 10.1111/j.1398-9995.2010.02534.x.Epub 2011 Jan 24. Review. Winans B, Humble MC, and Lawrence BP. 2011. Environmental toxicants and the developing immune system:a missing link in the global battle against infectious disease? ReprodToxicol 31:327-336. 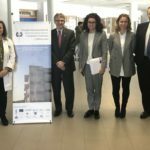 Guxens M, Aguilera I, Ballester F, Estarlich M, Fernández-Somoano A, Lertxundi A, Lertxundi N, MendezMA, Tardón A, Vrijheid M, Sunyer J; INMA (INfancia y Medio Ambiente) Project. Prenatal exposure to residential air pollution and infant mental development: modulation by antioxidants and detoxification factors.Environ Health Perspect. 2012 Jan;120(1):144-9. Epub 2011 Aug 25. Vrijheid M, Casas M, Bergström A, et al, Wright J, Nieuwenhuijsen M. European Birth Cohorts forEnvironmental Health Research. Environ Health Perspect. 2012 Jan;120(1):29-37. Hagmar L, Wallin E, Vessby B, et al. Intra-individual variations and time trends 1991-2001 in human serumlevels of PCB, DDE and hexachlorobenzene. Chemosphere 2006;64 (9):1507-13. Oken E, Østerdal ML, Gillman MW, Knudsen VK, Halldorsson TI, Strøm M, Bellinger DC, Hadders-Algra M,Michaelsen KF, Olsen SF. Associations of maternal fish intake during pregnancy and breastfeeding durationwith attainment of developmental milestones in early childhood: a study from the Danish National BirthCohort. Am J ClinNutr. 2008 Sep;88(3):789-96. Chatzi L, Kogevinas M. Prenatal and childhood Mediterranean diet and the development of asthma andallergies in children. Public Health Nutr. 2009 Sep;12(9A):1629-34. Review. Tricon S, Burdge GC, Jones EL, Russell JJ, El-Khazen S, Moretti E, Hall WL, Gerry AB, Leake DS, GrimbleRF, Williams CM, Calder PC, Yaqoob P. Effects of dairy products naturally enriched with cis-9,trans-11conjugated linoleic acid on the blood lipid profile in healthy middle-aged men. Am J ClinNutr. 2006Apr;83(4):744-53. Jedrychowski W, Perera F, Mrozek-Budzyn D, et al. Higher fish consumption in pregnancy may conferprotection against the harmful effect of prenatal exposure to fine particulate matter. Ann NutrMetab 2010. 56; 119-126. Hennig B, Ettinger AS, Jandacek RJ, Koo S, McClain C, Seifried H, Silverstone A, Watkins B, Suk WA.Using nutrition for intervention and prevention against environmental chemical toxicity and associateddiseases. Environ Health Perspect. 2007 Apr;115(4):493-5. Romieu I, Castro-Giner F, Kunzli N, Sunyer J. Air pollution, oxidative stress and dietary supplementation: areview. EurRespir J 2008. 31; 179-197. J. Landrigan, V. A. Rauh, and M. P. Galvez. Environmental justice and the health of children. Mt.SinaiJ.Med. 77 (2):178-187, 2010. Bolte G, Kohlhuber M, Weiland SK, Zuurbier M, Stansfeld S, Heinrich J. Socioeconomic factors in EU-fundedstudies of children’s environmental health. Eur J Epidemiol. 2005;20(4):289-91. Bolte, G. Tamburlini, and M. Kohlhuber. Environmental inequalities among children in Europe—evaluationof scientific evidence and policy implications. Eur.J.Public Health 20 (1):14-20, 2010. Vrijheid M, Martinez D, Aguilera I, et al. Socioeconomic status and exposure to multiple environmentalpollutants during pregnancy: evidence for environmental inequity? J Epidemiol Community Health. 2010 Oct25. Hou L, Wang D, Baccarelli A. Environmental chemicals and microRNAs. Mutat Res. 2011 Sep 1;714(1-2):105-12. Epub 2011 b May 14. Review. Bollati V, Baccarelli A. Environmental epigenetics. Heredity (Edinb). 2010 Jul;105(1):105-12. Epub 2010 Feb24. Review. Rusiecki JA, Baccarelli A, Bollati V, Tarantini L, Moore LE, Bonefeld-Jorgensen EC. Global DNAhypomethylation is associated with high serum-persistent organic pollutants in Greenlandic Inuit. EnvironHealth Perspect. 2008 Nov;116(11):1547-52. Epub 2008 Jul 16. Perera F, Herbstman J. Prenatal environmental exposures, epigenetics, and disease. ReprodToxicol. 2011Apr;31(3):363-73. Epub 2011 Jan 20. Walker DM, Gore AC. Transgenerational neuroendocrine disruption of reproduction. Nat Rev Endocrinol.2011 Apr;7(4):197-207. Epub 2011 Jan 25. Gohlke JM, Thomas R, Zhang Y, Rosenstein MC, Davis AP, Murphy C, Becker KG, Mattingly CJ, Portier CJ.Genetic and environmental pathways to complex diseases. BMC Syst Biol. 2009 May 5;3:46. Cavill R, Kamburov A, Ellis JK, Athersuch TJ, Blagrove MS, Herwig R, Ebbels TM, Keun HC. Consensusphenotypeintegration of transcriptomic and metabolomic data implies a role for metabolism in thechemosensitivity of tumour cells. PLoSComput Biol. 2011 Mar;7(3):e1001113. Kamburov A, Cavill R, Ebbels TM, Herwig R, Keun HC. Integrated pathway-level analysis of transcriptomicsand metabolomics data with IMPaLA. Bioinformatics. 2011 Oct 15;27(20):2917-8. Epub 2011 Sep 4.41?.Ala-Korpela M, Kangas AJ, Inouye M. Genome-wide association studies and systems biology: together atlast. Trends in Genetics, December 2011, Vol. 27, No. 12. 493-498. Jennen D, Ruiz-Aracama A, Magkoufopoulou C, et al. Integrating transcriptomics and metabonomics tounravel modes-of-action of 2,3,7,8-tetrachlorodibenzo-p-dioxin (TCDD) in HepG2 cells. BMC Syst Biol.2011;5:139. Patel CJ, Bhattacharya J, Butte AJ. An Environment-Wide Association Study (EWAS) on type 2 diabetesmellitus. PLoS One. 2010 May 20;5(5):e10746. Budtz-Jørgensen E, Debes F, Weihe P, Grandjean P. Structural equation models for meta-analysis inenvironmental risk assessment. Environmetrics. 2010 Aug 1;21(5):510-527. Shi M, Weinberg CR. How Much Are We Missing in SNP-by-SNP Analyses of Genome-wide AssociationStudies? Epidemiology. 2011 Nov;22(6):845-7. Clewell, H. J., Tan, Y. M., Campbell, J. L., Andersen, M. E., 2008. Quantitative interpretation of humanbiomonitoring data. Toxicology and Applied Pharmacology. 231, 122-133. Bartell, S. M., Griffith, W. C., Faustman, E. M., 2004. Temporal error in biomarker-based mean exposureestimates for individuals. Journal of Exposure Analysis and Environmental Epidemiology. 14, 173-179. Beaudouin, R., Micallef, S., Brochot, C., 2010. A stochastic whole-body physiologically basedpharmacokinetic model to assess the impact of inter-individual variability on tissue dosimetry over the humanlifespan Regulatory Toxicology and Pharmacology. 57, 103-116. Gibb, H. J., Checkoway, H., Stayner, L., 2002. Improving risk assessment: Priorities for epidemiologic research. Hum. Ecol. Risk Assess. 8, 1397-1404. Smith, T. J., 2002. Issues in exposure and dose assessment for epidemiology and risk assessment. Hum. Ecol.Risk Assess. 8, 1267-1293. Verner, M. A., Plusquellec, P., Muckle, G., Ayotte, P., Dewailly, E., Jacobson, S. W., Jacobson, J. L.,Charbonneau, M., Haddad, S., 2010. Alteration of infant attention and activity by polychlorinated biphenyls:Unravelling critical windows of susceptibility using physiologically based pharmacokinetic modeling.Neurotoxicology. 31, 424-431. Chadeau-Hyam M, Athersuch TJ, Keun HC, De Iorio M, Ebbels TM, Jenab M, Sacerdote C, Bruce SJ, HolmesE, Vineis P. Meeting-in-the-middle using metabolic profiling – a strategy for the identification of intermediatebiomarkers in cohort studies. Biomarkers. 2011 Feb;16(1):83-8. Epub 2010 Nov 29. Swann JR, Want EJ, Geier FM, Spagou K, Wilson ID, Sidaway JE, Nicholson JK, Holmes E. Systemic gutmicrobial modulation of bile acid metabolism in host tissue compartments. ProcNatlAcadSci U S A. 2011Mar 15;108Suppl 1:4523-30. Cavill R, Sidhu JK, Kilarski W, Javerzat S, Hagedorn M, Ebbels TM, Bikfalvi A, Keun HC. A combinedmetabonomic and transcriptomic approach to investigate metabolism during development in the chickchorioallantoic membrane. J Proteome Res. 2010 Jun 4;9(6):3126-34. Cáceres A, Armengol L, Villatoro S, González JR. MLPAstats: an R GUI package for the integrated analysis ofcopy number alterations using MLPA data. BMC Bioinformatics. 2011 May 11;12:147. Slama R, Werwatz A. Controlling for continuous confounding factors: non- and semiparametric approaches.Rev EpidemiolSantePublique. 2005 Nov;53 Spec No 2:2S65-80. Molitor J, Papathomas M, Jerrett M, Richardson S. Bayesian profile regression with an application to theNational Survey of Children’s Health. Biostatistics 2010, 11(3): 484-98. Papathomas M, Molitor J, Richardson S, Riboli E, Vineis P. Examining the Joint Effect of Multiple RiskFactors Using Exposure Risk Profiles: Lung Cancer in Nonsmokers. Environmental Health Perspectives 2011;119: 84-91. Liu P, Hwang JT. Quick calculation for sample size while controlling false discovery rate with application tomicroarray analysis. Bioinformatics 2007;23(6):739-46. Ebrahim S, Montaner D, Lawlor DA. Clustering of risk factors and social class in childhood and adulthood inBritish women’s heart and health study: cross sectional analysis. BMJ. 2004 Apr 10;328(7444):861. Epub 2004Mar 8. Vial Dupuy A, Amat F, Pereira B, Labbe A, Just J. A simple tool to identify infants at high risk of mild tosevere childhood asthma: the persistent asthma predictive score. J Asthma. 2011 Dec;48(10):1015-21. Epub2011 Oct 24. Druet C, Stettler N, Sharp S, Simmons RK, Cooper C, Smith GD, Ekelund U, Lévy-Marchal C, Jarvelin MR,Kuh D, Ong KK. Prediction of childhood obesity by infancy weight gain: an individual-level meta-analysis.PaediatrPerinatEpidemiol. 2012 Jan;26(1):19-26. doi: 10.1111/j.1365-3016.2011.01213.x. Epub 2011 Aug 1. Trasande L, Liu Y. Reducing the staggering costs of environmental disease in children, estimated at $76.6billion in 2008. Health Aff (Millwood). 2011 May;30(5):863-70. Epub 2011 May 4.
WHO 1984. Glossary of terms used in the “Health for All” Series No. 1–8. Geneva, World HealthOrganization, 1984.
WHO 1986. Ottawa Charter for Health Promotion. First international conference on health promotion. Ottawa,21 November 1986, WHO/HPR/HEP/95.1 (http://www.who.int/hpr/NPH/docs/ottawa_charter_hp.pdf). Rabinovitch N, Silveira L, Gelfand EW, and Strand M. The Response of Children with Asthma to AmbientParticulate Is Modified by Tobacco Smoke Exposure. Am J RespirCrit Care Med Vol184. pp 1350–1357,2011. Air quality guidelines. Global update 2005. Particulate matter, ozone, nitrogen, dioxide and sulfur dioxide. 2006(http://www.euro.who.int/__data/assets/pdf_file/0005/78638/E90038.pdf). http://ec.europa.eu/environment/water/water-framework/index_en.html. Water Framework Directive 2000/60/EC. 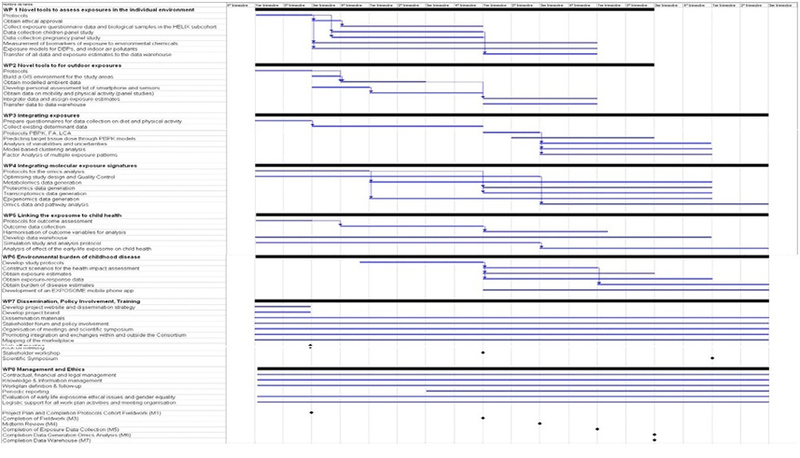 Project status, description of work performed and main results. The HELIX project is on- going and its termination will be due in 54 months, that is, 2Q2017. To start the fieldwork activities, PRI of the HELIX project mainly concentrated on the development of study protocols, questionnaires, monitoring and management tools, as well as recruitment of staff and volunteers. ethical approvals have been obtained, and project dissemination effort increased. WP1 is applying novel tools and methods to obtain robust estimates of exposures to persistent and non-persistent pollutants in food, consumer products, water and indoor air, during pregnancy and early childhood. Work has focused towards developing extensive questionnaires and protocols for the Subcohort, Child and Pregnancy Panel Studies. It includes selection of biological samples to betaken and the development of exposure related questions for the common questionnaire. The work of other WPs has been integrated into the fieldwork protocols. The Subcohort fieldwork of 1200mother-child pairs is being carried out by the cohorts: BiB (UK), EDEN (France), INMA (Spain), KANC (Lithuania), Rhea (Greece) and MoBa (Norway). All but MoBa are participating in the Child Panel Study, while the Pregnancy Panel Study is carried out in France, Spain and Norway. WP2 is developing novel tools and methods to obtain robust estimates of chemical and physical exposures in the outdoor environment, focusing on key outdoor exposures (outdoor air pollutants, noise, green space, UV radiation). Focus currently lies on building the GIS environment, developing the personal assessment kit and to commence the collection of ambient and further data as part of the panel studies. WP3 aims to integrate data on multiple exposures, exposure determinants, and exposure variability, in order to define multiple exposure patterns and describe exposure uncertainties. As part of the fieldwork questionnaire development, new questionnaires were designed to characterize dietary intake and physical activity for the HELIX Subcohort. Factor Analysis of multiple exposure patterns and the model-based clustering approach have been discussed in the Helix statistical workshops, and are under development in the R package in progress. WP4 is to determine molecular signatures associated with environmental exposures through analysis of profiles of metabolites, proteins, RNA transcripts and DNA methylation. Protocols have been written for sample collection, processing, shipping and ‘omics’ analyses. Key was the optimization of the study design, assessing detectability and analytical variability of the omics methodologies, defining Quality Control strategies and examining the biological variance within and between individuals using a small number of samples from a single cohort in the Child Panel Study. For WP5, which characterizes the short- and medium-term effect of the exposome on specific highly prevalent child health outcomes, health outcome examinations are ongoing in the HELIX subcohort fieldwork, while the design of the HELIX data warehouse is on its way. A simulation study has started to compare the efficiency of various statistical approaches considered to assess the impact of the Exposome on human health. WP6 aims to estimate the burden of common childhood diseases that may be attributed to multiple environmental exposures in Europe. A protocol for the development of a HELIX pollution monitoring and routing app has been established, which will allow users (walkers, cyclists, runners) to accurately monitor their exposure to environmental pollutants and provide alternative routes. A start has been made to a study protocol and with the identification of exposure-response functions and the exposure level of different pollutants and outcomes, through literature review. WP7, responsible for establishing and maintaining a framework of communication, dissemination and engagement with HELIX stakeholders, has established the HELIX dissemination and communication strategy. Tools and activities tailored to the high variety of stakeholders include the project website (www.projecthelix.eu), interviews and publications. Further details regarding WP status, deliverables,any other recent project update and so on, can be checked at HELIX’s website as well/ at any time. Expected final results and their potential impacts. 1) exploit available or to-be-developed novel tools and methods to integrate and link environmental data with health data and information, and apply them to (large-scale) population studies. 2) Contribute to the definition of an integrated exposure concept and prediction of individual disease risks related to environment. 3) Reduce uncertainty in risk assessments of chemicals. 4) Provide a better understanding of the effect of multiple exposures, such as to mixtures of chemicals, behaviour, and the physical environment. 5) Improve preventive strategies to lower health costs. 6) increase EU competitiveness, especially that of SME’s that may find new business sectors in exposure characterisation and modelling. 8) lead to a reduction of the environmental burden of disease. Definition of an integrated exposure concept. Prediction of individual disease risks related to environment. Reduce the uncertainty in risk assessments of chemicals. Better understanding of the effect of multiple exposures, such as to mixtures of chemicals and behaviour/physical environment. Improve preventive strategies to lower health costs. Increased EU competitiveness, especially that of SME’s that may find new business sectors in exposure characterisation and modelling. Added value at European level. The exposome concept calls for an integrated approach to environmental exposure. This is only possible by pooling expertise and research resources across countries. Furthermore, only through this European dimension can we take full advantage of the ongoing effort in other EU FP7 Environment and Health projects. HELIX includes cohorts from all parts of Europe: North, East, South and West and will thus address pan European problems and promote a truly pan-European partnership. We will improve generalizability and increase power of analysis through multi-centre sampling. The health impact scenarios developed by HELIX will take account of all available information in European birth cohorts and other data sources. 4) Environmental policy making has an important European dimension; the added value of gathering data in multiple European countries is important to impact for the development of European policies and regulations by taking into account different country scenarios. Derived publications. Communication – dissemination activities. Publications. Aside from regular updates and newsitems provided through the HELIX web (http://www.projecthelix.eu/en/publications) and/ or social media, we like to inform stakeholders through e-newsletters. Two of them have been released up to date, in February and December 2013. Besides, and because of been one of the deliverables, an information leaflet was published(June 2013). Printed on recycled paper, its publicationwent hand-in-hand with HELIX’s brand development, i.e. the colours and symbols associated with the HELIX. An electronic version is available through the HELIX website. HELIX relevant findings will be published in peer- reviewed journals; amongst the ones being targeted are “Nature” and “Science”, as well as others in key fields of interest. Actually several papers were prepared/ have been submitted and are under revision/ awaiting publication.Besides, we at HELIX aim to publish in Open Access media/ platforms if this does not infringe rights of third parties. Congress, events &/or workshops attendance or organization. As planned, a first workshop has been held six months after HELIX came into live (meeting date: June, 2014). All consortium’s partner attended, it took place in Barcelona (Catalonia, Spain) and fieldwork progress, laboratory analysis and statistical methodology were key items on the agenda.